Today I had the pleasure of teaching to over thirty yogis at Lululemon Athletica in Tampa's Hyde Park Village. It was both exhilarating and terrifying but I made it through my planned sequence and ended on time. 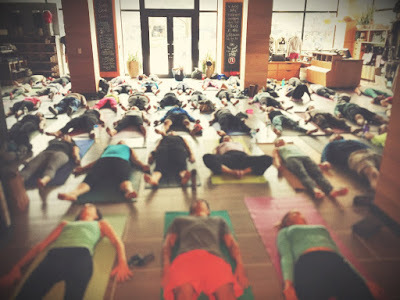 It was a fantastic experience to lead a group of that size through a yoga practice! I did forget to do side plank on the left side however... ha ha! I recorded the sequence (uploaded to bandcamp & mixcloud), the playlist is on Spotify & 8tracks and the visual for the sequence is also on Pinterest as well as attached to this blog entry.